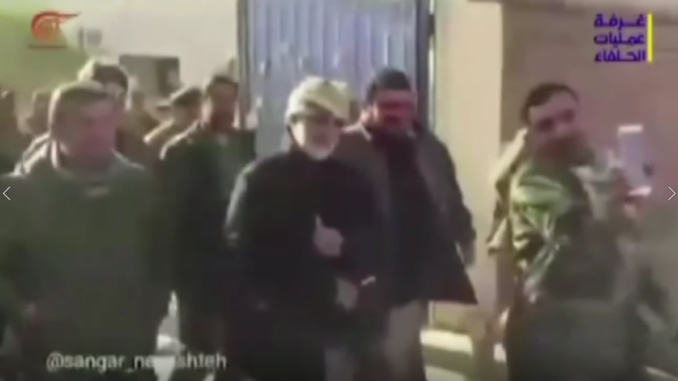 Recent footage aired by the Beirut-based Al Mayadeen Tv shows the commander of Iran’s elite Quds Force, General Qasem Soleimani, strolling around Albukamal, the last city that Daesh (ISIS) held onto. Soleimani reportedly directed the battle to recapture the city from Daesh, by leading forces from the so-called ‘resistance axis’, which is said to include Iran, Iraq, Syria, and Lebanon’s Hezbollah. With the recapture of Albukamal, the resistance axis declared complete victory over Daesh and its ‘Islamic State’, with only small pockets of Daesh members remaining in certain regions of Syria and Iraq. These images show the commander of the Quds Force of the Iranian Revolutionary Guards Corp, General Qassem Soleimani. This footage was filmed after the liberation of Albukamal in Syria. The liberation of this city from Daesh (ISIS). Ofcourse this city had been liberated once (already), yet Daesh had recaptured it once again. However now, after the operations of the resistance, and the Syrian army ofcourse, and the allies in the resistance axis and all the participating factions, this city was liberated. Ofcourse here the huge role played by the commander of the Quds Force of the Iranian Revolutionary Guards in liberating this city, and (his role in) devising the military and battlefield plan for its liberation, must be highlighted. We see him now as he walks around with the fighters and soldiers from all factions of the resistance axis, (we see Soleimani) visiting them. This footage was filmed after the liberation of the city, meaning after the end of operations and the announcement of victory over Daesh in the border city of Albukamal, (situated) between Syria and Iraq. So this is footage that we have received from the operations room of the allies – allies within the resistance axis ofcourse – (footage) ofcourse of the commander of the Quds Force, General Qasem Soleimani. Ofcourse here it must be pointed out that the (Iranian) Revolutionary Guards were also present in this operation, and ofcourse, it was the last city that Daesh was occupying in Syria. The city is of great strategic value, as it was the last stronghold of Daesh, it had a (large) number of Daesh leaders within it, and these operations have come to an end today. In the morning there was an announcement that about 85% of the city had been liberated, however with this day coming to an end, it was announced that Albukamal has been completely liberated from Daesh for good.